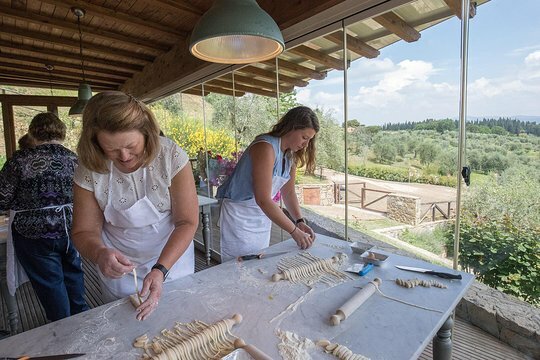 A full day hands-on Cooking Class in a stunning setting in the Tuscan countryside including a food tour through the historic central food market of Florence. 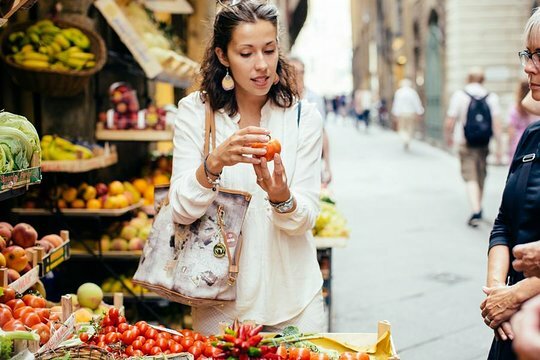 Led by a local food-lover guide, you will enjoy tastings and experience Tuscan food like a real local as well as buying the ingredients in this vibrant market. On arrival in our beautiful farmhouse, you will start creating a complete menu, from appetizer to dessert, using only the freshest seasonal ingredients, the majority of which come from the vegetable garden of the farmhouse! Be prepared to role up your sleeves and learn to cook as Tuscan grandmas and mums do every day in their kitchens for their families. Master the secrets of traditional dishes that you will easily re-create at home for your friends and family. The cooking lesson is suitable for beginners and for those who can already cook. Then finally we will all sit together on a terrace hosting incredible views over the Tuscan hills and just like a big Italian family, we will take time to enjoy the food we have prepared together. Buon appetito! First discover Florence's historical food market where the locals do their daily shopping. Blend in with the locals. Meet the bakers, the butchers, and the farmers selling vegetables from their fields. Their stalls are full of items such as fresh fruit, vegetables, cheeses, cured meats, balsamic vinegar, sun dried tomatoes, olives and many other Italian food specialities. Shop for the ingredients to use for the cooking class and learn to choose the best seasonal products. Then it's time to start your cooking lesson at a farmhouse in Tuscany. This isn't just a demonstration, you will actually take part in creating a full traditional Tuscan meal with our chef's help. You will learn to make real Italian fresh pasta by hand with freshly laid eggs and learn to make a traditional meat sauce using ingredients from right outside the door! Learn to prepare classic bruschetta with fresh bread, homegrown tomatoes and the farmhouse's own extra virgin olive oil and then take a break to enjoy the bruschetta with a glass of Chianti wine. After the break it's back to the lesson where you will learn how to prepare traditional Tuscan roast pork, arista and Tuscan roast potatoes using fresh herbs collected from around the farmhouse. To finish the class, you will learn the secrets of the wonderful Italian coffee and cream dessert, Tiramisù. At last sit down to enjoy a wonderful meal. Each course will be paired with a carefully selected wine from the region to compliment the flavors of the food you have prepared. 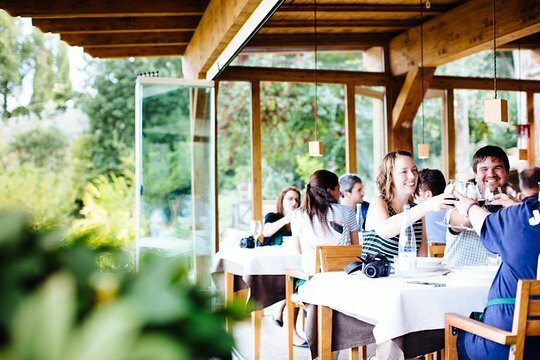 At the end of your meal, your driver will be waiting for you for a short drive back to Florence, so it's time to say arrivederci after an unforgettable experience in Tuscany. My friend and I took the Tuscan cooking tour and had the best time. Carmela and Isak were so entertaining and created such a memorable experience. The food we all prepared as a group was fun to make and delicious to eat. I would HIGHLY recommend this tour if you visit Florence. The has been my 5th time in Florence and probably the best day out of all my trips. Fabulous. Family with adult children. It was so much fun and a great learning experience. I couldn’t have booked a better experience for the 5 of us to share. Would do this again. Can’t wait to get the recipes. Our cooking class with Isak and Carmela was one of my highlights while in Italy. Without any exaggeration everything about this tour was amazing. We started off by going to the market picking up amazing fresh ingredients and followed it by driving up to the country side. Their we had a meal to prepare in which we all worked together to create. Their were lots of laughs and jokes along the way. The scenery was amazing and the company and ambience was as well. This was exactly what I would recommend to any of my family and friends! Not to mention this was probably one of the best meals I had while in Italy. I would do it again in a heart beat! This day, cooking in a beautiful kitchen overlooking Florence was not only the unmistakable highlight of our trip, but was also a dream come true! The various dishes we created were mouthwatering and quintessentially Italian. This cooking class was the highlight of our trip and will be a treasured memory for the rest of my life. Lavie was an amazing tour guide and showed us the ins and outs of the local market. We stopped at each type of stand (produce, cheeses, meats, etc.) and were given an overview of the history and the importance in Florence. After a quick bus ride, Lavie delivered us to Isak - the energetic cook who would teach us all we needed to know. I consider myself a good cook (I cook at home at least 5 days a week) but was still able to learn much about traditional Italian cooking. If Lavie and Isak aren't enough to convince you to book this class, the views from the Tuscan farmhouse will do it. I could have sat on the terrace for hours staring into the hills. This place is BEAUTIFUL. It took us a while to decide how to describe this experience. We spent two weeks in Italy for my wife's birthday and this was one of, if not the absolute best memory of the trip. Starting with Isak gathering us at the train station, we knew this was going to be special. There were 27 people in the class, all lined up checking in with him in the morning, he went down the line to each and every person asking our name and where we were from. From then on, he knew every single person's name as he had know us for years, for the entire day! I've never seen anything like it. We walked from the train station to the central market, the whole way with Isak telling stories (with an amazing wit and sense of humor) until we reached the market. Once at the market, we meandered through buying our ingredients for the day, all the way with Isak telling more stories and history of Tuscan cooking with his witty sense of humor. We then boarded our bus to the beautiful Tuscan farmhouse where where we would join the second part of our amazing teachers, Carmela. She is equally as amazing as Isak and they make an incredibly great team, both in knowledge and especially entertainment. Isak is American that speaks Italian and Carmela doesn't speak much English, the combination and their ability to play off of each other makes for a priceless experience, they are absolutely wonderful together and had everyone laughing the entire time with Isak's jokes and Carmela's singing! Now on to the food we cooked! I fancy myself as a decent cook, but I was taken to another world here with what they showed us to do and was amazed at how simple the ingredients are, yet very complex and amazing flavors we produced. We made Bruschetta, Pesto, Ragu meat sauce (best I've ever had),fresh pasta, roast potatoes, an incredible pork roast and Tiramisu for desert, along with very healthy amounts of wine! :) This meal lead by Isak and Carmela was actually our favorite meal we had during our entire trip in Italy. 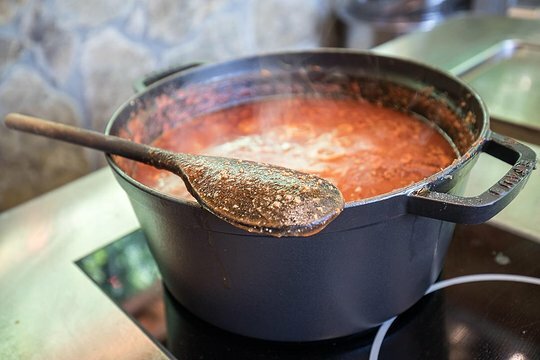 We loved it so much that within two weeks of being home we have made the Ragu and bruschetta twice before we even received the recipes, which you will receive after your trip. This was a long review, but I really cannot say enough amazing things about this experience. The hosts, the food, and the memories will be with us forever, If you are looking for a truly amazing day in Tuscany book this tour. We would do it again and again. Thank you Walkabout, and especially Isak and Carmela. YOU GUYS ARE AWESOME!!! Fantastic cooking class. I would highly recommend to anyone. It was informative while being fun and entertaining. The food and wine were fabulous. We had 9 in our group and everyone thoroughly enjoyed the class. This is definitely a 'must do in Florence' event. Our cooking class with Isak and Carmela was the highlight of our trip to Florence! We had a wonderful time exploring the market to get our ingredients, and traveling to the Italian countryside to prepare our meal in a beautiful kitchen with a stunning view of Tuscany. We didn’t want to leave! Isak and Carmela were wonderful! We would return in a heartbeat. We decided to take this tour because a friend told us it was the best thing he had done during his time in Italy. I thought that may have been a little bit of an exaggeration but he was right. Isak was an awesome guide through the market. He was knowledgable about everything asked of him. He was funny, patient and probably the best looking man in all of Tuscany. Carmela is one of a kind. Speaking only Italian with Isak translating she has more energy than my 2 kids combined. She has the whole class laughing the entire time. This truly is a gem. We made some amazing food, drank some great wine, and made a memory that we won't soon forget. The class is well worth the money, the views are spectacular and the people are genuine and fun. I really can't speak highly enough of this tour. A day of good food, good wine, learning and fun in Tuscany! After quickly realizing that Isak's quiet manners was a cover up for a fun and enthusiastic persona, we enjoyed a day of learning not only how to assemble delicious dishes from combining the appropriate fresh ingredients, but details on why and tips on how to make it all work towards great results. Isak answered questions and gave clear demonstrations and instructions that we could all follow in an entertaining and funny way. Special kudos to Mary, the canonical Italian grandmother who also helped us make delicious pasta and tiramisu, as well as the rest of the staff at the stunningly beautiful location.